This content originally appeared on Demand Gen Report on May 19, 2017. Visit Demand Gen Report for the latest news and trends on B2B Marketing. At a recent industry event, the above question was posed by marketers and industry observers, who wondered out loud where the account-based marketing train was actually headed. It’s certainly a question worth pondering, especially as the marketing-tech world has become awash with buzz-worthy new technologies promising all manner of sales, revenue, and AI-powered Nirvana. There’s no doubt that ABM has been overhyped. The vendor community has glommed onto the term in the hopes of marketing their wares. And, to be blunt, there are companies assuming the ABM mantle that have no business doing so. That level of ABM hype is unsustainable and ultimately detrimental to the marketers who are looking for proven solutions to solve very real business challenges. All of that said, hype is a fact of life in emerging technology. Just because ABM has attracted its share of buzz does not mean it’s a fad. ABM has grown so rapidly because A) companies had a strong need to improve their targeting, engagement, and conversion of high-value prospects, and B) new technology emerged which enabled all that while doing something really revolutionary: orchestrating human connections at scale. There is nothing faddish about developing a measurably better and more productive way to engage and convert your best customers and prospects. ABM delivers on that promise every day. 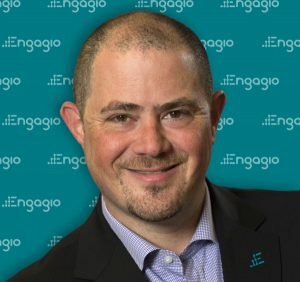 As I have said since before launching Engagio just over two years ago, ABM is akin to “fishing with spears.” By contrast, the first big martech innovation—marketing automation—was analogous to “fishing with nets.” These are two very different, but complementary, types of marketing that meet very different needs. Using “nets” works well when you are targeting prospects with lower Average Contract Values (ACVs), such as those that are less than $20K.When you are pursuing larger fish—and especially enterprise “whales”—“spears” are the right tools for the hunt. Of course, there are also some companies for which a “hybrid” fishing approach is the best way to go—using both nets and spears. At my own company, Engagio, we use marketing automation as well as our signature ABM solutions. Ten years ago, there was a hodgepodge of tools that helped marketers scale their net fishing. Then, marketing automation integrated those tools into the platform that became a must-have for modern marketers. Fast forward to today and we are seeing the emergence of new platforms that are bringing together similarly disparate tools and point solutions to help marketers pursue their high-value accounts—the biggest fish—with spears. These new “marketing orchestration” platforms are very different than their marketing automation cousins. Why? Because fishing with spears requires marketers to orchestrate human connections at scale, in addition to orchestrating account-based data, various systems and operations, and data-driven insights. To do all of that, and generate true account-based engagement (which is the Holy Grail of the spear-wielding ABM marketer), you need a marketing orchestration platform. I believe marketing orchestration is the engine that is driving the rapidly growing era of Account-Based Everything. Marketing orchestration is very different from the last few martech cycles that included trends such as content management and predictive, which was just another way of doing lead scoring. A marketing orchestration platform represents a fundamentally different technology designed to empower marketers to engage, measure and convert accounts at scale. I believe it is a sea change in marketing, not a temporary phenomenon. Marketers have a reputation for loving what is new and trendy. But, ABM driven by a powerful marketing orchestration platform, is not one of those fleeting fads. It is a proven, highly scalable way to use the sharpest and strongest “spears” to land the biggest, most profitable whales. I’d call that a marketing revolution worth joining. Jon Miller is CEO and Founder of Engagio. Previously, Jon was the VP Marketing and Co-Founder of Marketo. He is a speaker and writer about marketing best practices and is the author of multiple Definitive Guides, including Marketing Automation, Engaging Email Marketing, and Marketing Metrics & Analytics.